Synopsis- Dark myths, medieval secrets, intrigue, and romance populate the pages of the first-ever teen series from #1 bestselling author of The Other Boleyn Girl. Review- Changeling, is the first book in Philippa Gregory’s new YA historical trilogy, The Order of Darkness. Set in Italy, 1453 it follows Luca Vero and Lady Isolde, two seventeen year olds whose paths cross at The Abbey of Lucretili, a Roman nunnery. Luca is in training for the priesthood but is singled out as disobeying the order because of his independent mind and desire to find answers to problems. Instead of throwing him out, he is offered a special mission of inquiry to investigate evil across Europe and put his inquisitive mind to good use for the church. His first job is at The Abbey of Lucretili where young Isolde has been forced to take a vow of celibacy and devote her life to running the nunnery as was dictated to her by her father’s last wishes. Her brother has inherited the estate and she has been left penniless and with no free will. Luca arrives at the nunnery and takes his investigation very seriously. There’s strange things happening at the Abbey, with nuns sleepwalking, some the victim of stigmata, and others seeing strange visions. The nuns blame Isolde for the strange occurrences which began when she arrived with her servant Ishraq. At first, I wasn’t sure whether I was going to relax into the story because of the Christianity aspect and the religious settings. But what I could relate to was the scientific aspects and Luca’s investigative skills that he utilises to give all the nuns a fair say and to determine the cause of the problem. In many ways, Changeling crosses over from historical into mystery, crime fiction and fantasy too which made me enjoy it more so. Isolde is a strong young woman, initially grieving her father and destitute, but her core strength seeps through and her determination to overcome the allegations made against her. Her friend Ishraq is a mysterious character who I would like to learn more about in the next novel. Luca’s side-kicks Freize and Peter add another dimension and their interactions are enjoyable to observe. Luca and Isolde have an obvious affection for each other but it does not develop beyond friendship in this first instalment. I imagine this will be explored further in the sequel as they will both have internal conflicts and religious commitments to overcome if their relationship is pursued by the author. I haven’t read any of Gregory’s adult titles, but I am a historical fan and know that she is quite highly respected in this field, and there has been some excitement about her break-out into the YA market. So what sets it apart from adult historical fiction? I think the main things that stand out to me are the adolescent characters, the simple and easy to read writing style that focuses on characters and dialogue rather than poetic prose or overly descriptive accounts of the setting. The story is portrayed in a somewhat innocent sense, despite obvious adult topics that are covered in the book. This contrasts with the more vivid detail and sometimes shocking scenes that is prevalent in the historical fiction genre, targeted to an adult audience. It also has drawings at chapter breaks and scenes are divided by a snazzy little medieval design. At just 260 pages, Changeling is a quick read that provides enough of a taster to draw you in to the characters and the plot and leaves you wondering at the end what is next in store for them. Although Changeling didn’t blow me away, I did enjoy it and I think it served its purpose in making me want to pick up the second book in the series. 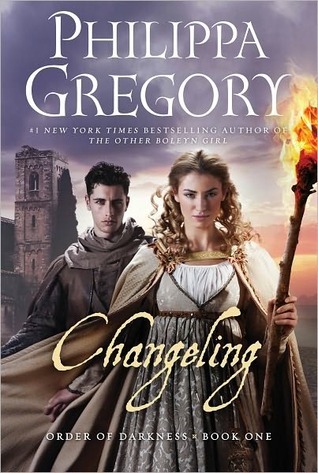 Don’t expect sexual chemistry, love-struck teens and a passive heroine, because Changeling offers intelligent characters who speak older than their age, old-school love story development and a fantastical setting amidst early roman times. Definitely worth a try for YA fans who would like to try something different. Ohhh, I’ve been looking at this book since it’s come out. I’ve noticed it several times in my local bookstore and I’ve been iching to pick it up (unfortunately funding is bashing that in the head for the moment, haha), but your review has definitely encourage me to go out and buy it. A quick read is probably in need because Gregory’s adult books do tend to be hefty reads. Neverthless I’ve enjoyed the one I have read, The Boleyn Inheritance and I have the first of the series, The Other Boleyn Girl to read. Glad to hear you enjoyed this and it certainly sounds like my type of YA with intelligent characters and not mindless idiots! I completely agree with you, smart YA characters are a must! Changeling will be a much quicker read than the author’s adult books.